In the nineteenth century, Matrons were appointed to various institutions to oversee their domestic arrangements. The New South Wales Deaf and Dumb and Blind Institution (DDBI) was governed by a Gentleman’s Committee, elected annually by subscribers, and a women’s committee, initially largely the wives of the gentlemen and referred to as the Ladies Visiting Committee (LVC), who directed the Matron in her duties. The domestic arrangements of the house are conducted by … the matron of the institution, who, under the direction of the ladies’ committee, superintends the internal affairs of the establishment; she also presides at table, accompanies the pupils in their walks, and regulates the general regime of the household. The post is a difficult one, requiring not only the kindly firmness necessary to the mistress of every such establishment, but an intimate knowledge of the peculiarities of the deaf and dumb – a knowledge which can only be acquired by long experience and patient observance. Such a view emphasised just one of the relationships which made the role difficult. There were three relationships that were important and challenging for any Matron. Firstly, the relationship with the LVC to whom she was directly responsible and through them to the Gentleman’s Committee, secondly the relationship with the master in charge and other staff, and finally the relationship with the children themselves. The powerful LVC, under the influence of its long-time secretary Ann Goodlet, was probably the most important of these relationships and their attitudes about the Matron’s efficiency were formed by how well she administered the household. As part of the Matron’s administrative role the LVC were also concerned with staff relationships and how the children were treated. No records of the LVC have survived, but the scope of their activities can be seen in their correspondence with the Gentleman’s Committee and the requests made by the Committee for the LVC’s assistance. Ann Goodlet, an active committee member from 1863, was appointed secretary of the LVC in 1873 and it is evident from the Committee’s minutes that she was most energetic in the pursuit of her duties. In this role, to which later was added that of president, Ann exercised great influence on the operations of the DDBI. The LVC was concerned with the selection and monitoring of the performance of the domestic staff. This included, most importantly, the appointment of the Matron, but it would appear to have even extended, on occasions, to the engagement of some of the teaching staff. The actual appointments were made by the Committee, but on the advice and recommendation of the LVC. Matrons seemed to have resigned to the LVC and such resignations were then forwarded to the directors. The views of the LVC, which were probably up to the end of the century largely those of their Secretary Mrs Goodlet, carried great weight and, on occasions, carried even greater weight than the judgement of their respected Superintendent, Samuel Watson. visiting, at their own homes, such of the distressed inhabitants of Sydney as belonged to the educated classes and had seen better days, but who had been reduced to poverty, and who, from their position, from their more refined feelings and associations, were utterly unable to go into the streets to beg, and who were pained at the very idea of soliciting charity in any form. In Sydney the formation of HVRS was discussed in the Judges’ Chambers at the Supreme Court Sydney on December 16, 1861 at a meeting chaired by Sir Alfred Stephen. It was attended by Mr Justice Wise, Mr Justice Milford, Sir W M Manning, the Rev A H Stephen, Dr Douglass and five or six other gentlemen that included Captain Samuel North, Dr Charles and probably John M’Lerie, Richard Jones and Captain Scott. According to Sir W M Manning it was Dr Henry Grattan Douglass whose proposal it was to form such a society and that he took the idea from a society of the kind that had existed for some time in Ireland (the ‘Poor Room-Keeper’s Society’). So, as Manning said, the origin of the Society was due to Ireland and an Irishman. The nucleus of the society’s funds was £100 which Douglass managed to persuade W C Wentworth to give, being a month of his salary as President of the Legislative Council. John Nicholson Mailer (1825-1892) was born in Edinburgh to Andrew Mailer, a stone mason, and Marion Nicholson. His older brothers, Andrew and Robert, were shoemakers and John, at aged 16, was also apprenticed to that trade. John became a bookbinder, however, and married Mary Cochrane in July, 1852 in Edinburgh at St Cuthbert’s. Andrew and Robert emigrated to America; Andrew in 1849 and his brother Robert and his mother Mary sometime before 1851. John and Mary decided to come to Australia and arrived in the colony of New South Wales in November 1854. 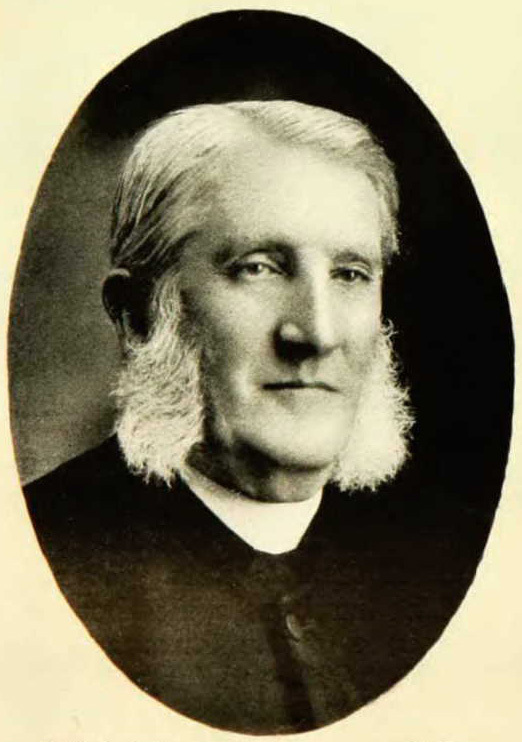 Their eldest son Andrew (1854-1902) was born in Scotland and the Mailers had four other children in Australia: John Henry (1857-1887), Robert Adam Thomson (1861-1925), Mary (1862-1937)  and Ida Marion (1868-1868). In Sydney, John found work in his trade as a book binder and became an assistant to James W Waugh in Waugh and Cox’s stationery and bookselling business in 1855. 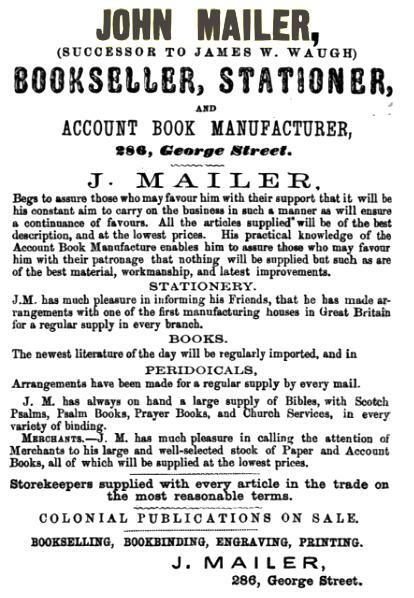 In November 1862, John purchased the business operating at 286 George Street, Sydney, and advertised himself as a stationer and account book manufacturer, telling potential customers that ‘his practical knowledge of the Account Book Manufacture enables him to assure those who may favour him with their patronage that nothing will be supplied but such as are of the best material, workmanship, and latest improvements.’ The business did not appear to prosper and by August 1864 all his assets were assigned to Trustees on behalf of his creditors and by November 1865, he had decided to cease trading and by December 1865, all his stock had been sold to pay off the creditors. 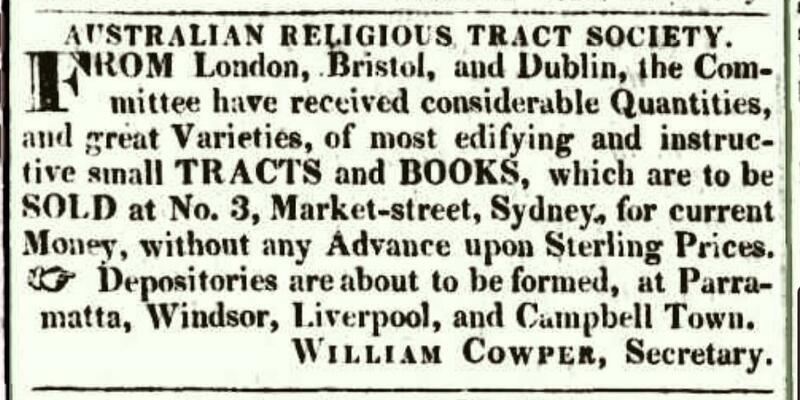 In 1866, it had been necessary for the jointly operated bookshop of the British and Foreign Bible Society and Religious Tract and Book Society (RTS) to dismiss their depository and to seek a new appointment. The Society had not been served well by its recent appointments as in 1862 the then depository, Joseph Holloway Morrison, was found guilty of embezzlement of society funds to the amount of about £600. 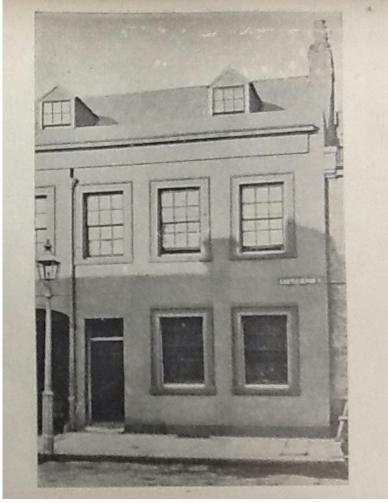 The newly advertised position attracted a salary of £250 with residence at the Bible Hall, Pitt Street, and the successful applicant was also required to post a security of £500. John Mailer applied and was appointed. Its governing committee consisted of the Reverends Richard Hill (Assistant Chaplain, Anglican), John Dunmore Lang (Presbyterian), Benjamin Carvosso (Wesleyan), William Cowper (Secretary, Anglican) and three laymen James Chandler, Alexander Kenneth Mackenzie (Treasurer) with George Williams as Collector and Depositary. William Cowper was a driving force of the society being its secretary for the first 16 years of its existence only relinquishing the role of secretary in 1839 when his eyesight began to fail. By 1826, the Society had obtained the support of the Governor as Patron, its funds had increased and some 62,882 tracts had been circulated during the year. The society was the beneficiary of support from ‘home’ through grants from the Tract Societies of London, Bristol and Dublin upon which the RTS had been modelled. Initially, support for the society was strong and numerous ladies attended its annual meeting and this was a sufficiently novel occurrence that their attendance, which ‘enlivened the meeting with their presence’, was especially remarked upon. … in the course of conversation he informed me that he had been a professed Atheist until within a few months, but that the perusal of a tract – the Dairyman’s Daughter, I believe, had been instrumental in awakening him from his own vain dreams. He wished to partake of the sacrament of the Lord’s Supper, and afterwards he did so. Many instances of good, resulting from the circulation of your tracts, have occurred within the last year or two. Some are now united with Christian churches, who, but for these silent messengers, might have remained dead in sin. One old woman, between eighty and ninety years of age, discovered by a tract distributor, ignorant and indifferent, is now giving evidence of a saving change wrought in her heart by the Spirit of God. 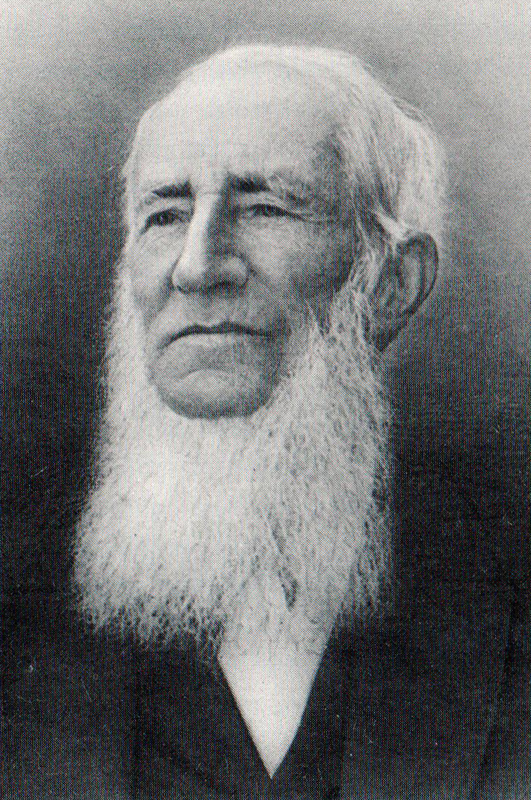 Samuel Goold was born in 1820 in Norton Lindsay, Warwickshire, England, the son of William Goold, variously described as a miller or a grocer, and his wife Elizabeth Canning. Samuel was their fifth son of nine children. Two of his brothers, John and Jabez, also came to the colony of NSW at some stage. In 1847, Samuel married Mary Ann Johnson at the Tottenham Baptist Chapel and his profession was given as ‘Missionary’. Mary Ann was the daughter of Philip Johnson, a shoemaker, and his wife Mary and was born in 1819 at the workhouse of St Botolph, Aldgate, London. At the age of 13 she became a member of the Congregational Church, worshipping in the Poultry Chapel, London, then under the care of the Rev John Clayton Jnr (1780-1865). Together with Mary Ann’s mother and sister, Samuel arrived in Queensland in January 1849 aboard the Fortitude, Rev Dr John Dunmore Lang’s first chartered immigrant ship. Samuel had been an apprentice and was probably an apprentice draper, but his profession on the shipping lists was given as ‘bricklayer’. 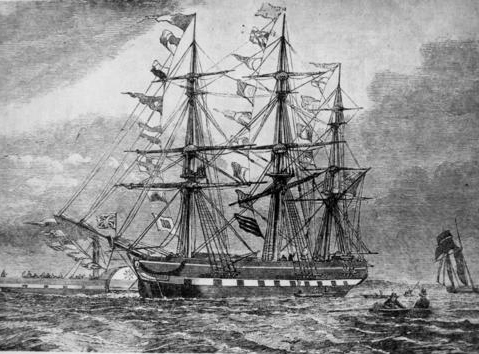 It has been suggested that he helped build the Roman Catholic Chapel in Elizabeth Street, Brisbane, but this cannot be possible as the Fortitude arrived in Morton Bay on 21 January 1849, and its passengers were quarantined as there were cases of typhus on board. The first mention of ‘Mr Gould, the builder’ in connection with the Roman Catholic Chapel, is on 31 January 1849 while Samuel Goold was still in quarantine.